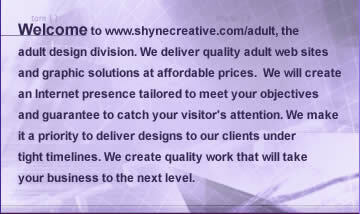 Welcome to Shyne Creatives custom adult logo - adult banner design, custom adult flash banner designs and graphic solutions web site. We offer affordable graphic design and cheap adult logo design - adult flash banner design services at very low cost. If you have a custom banner; whether it be a static gif adult banner or flash animated banner, Shyne Creative is the one for you. We build flash banners or gif animated in all type of sizes to accomodate your needs. We understand that a typical 468x60 adult banner may not suite all your advertising needs. We will customize graphics to be suitable to advertise your adult website.